Sister Mary burst into the office of the principal of Our Lady of Perpetual Motion parochial school in an advanced state of agitation. "Father!" she cried, "just WAIT until you hear this!" The priest led the sister to a chair, and said, " Now just calm down and tell me what has you so excited?" 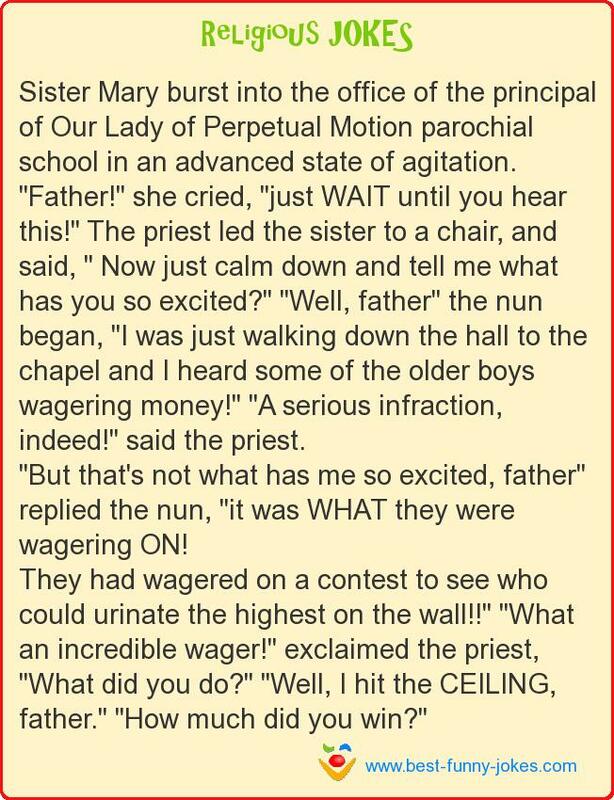 "Well, father" the nun began, "I was just walking down the hall to the chapel and I heard some of the older boys wagering money!" "A serious infraction, indeed!" said the priest. "But that's not what has me so excited, father" replied the nun, "it was WHAT they were wagering ON! They had wagered on a contest to see who could urinate the highest on the wall!!" "What an incredible wager!" exclaimed the priest, "What did you do?" "Well, I hit the CEILING, father." "How much did you win?"